I bonded the engine bearers into the hull at the end of May and then had to wait for some more MAS epoxy to arrive before I could start the filleting. They are now fiberglass taped and awaiting stage 2. 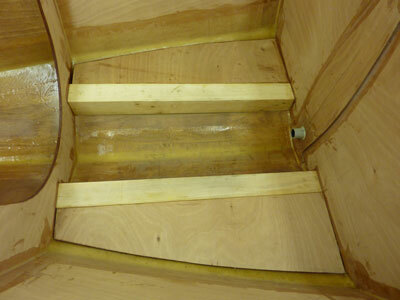 Having filleted and glassed the engine (motor) bearers in position I boarded the area outside of the bearers. This will be where I mount the batteries, assuming I still go electric. My philosophy of rarely throwing out a piece of timber paid off when I cut these two shelves out of a couple of gash pieces of ply left over from the hull construction. Now, that was long time ago. 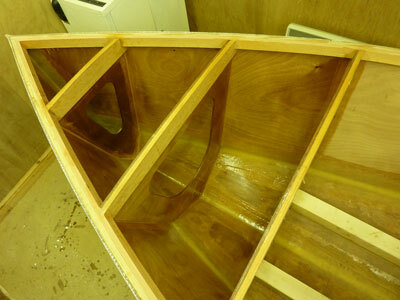 Next month I'll have these filleted and glassed over and be ready to move onto the engine bay hatch structure. 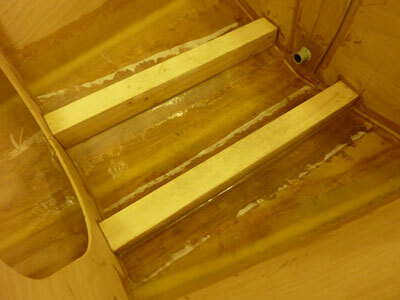 I also took the opportunity to seal with epoxy the inside of the hull forward of the engine compartment.